A new update of Brothers In Games is available with an improvement of the tournament details. I have added the information about the tournament charge, location, date and time of the event. 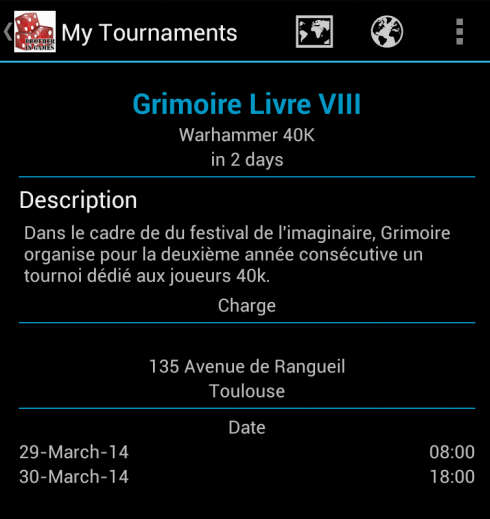 Once again, remember that currently the tournament information is gathered from TableTop Tournaments and is available in the organiser language, here in french. A set of actions is also available on this screen in the action bar. The display may vary depending on your device. If an action is not shown as an icon, it is in the menu on the right. View on a map, will locate the even on your favorite map app. View details on the web page. This will open your browser on the webpage added in the tournament informations. Add to calendar. Currently, this action is disabled and will be available soon. Delete the tournament. This one is, I think, obvious. Feel free to say in the comments what you think about those actions and their location. Unfortunately, this update revealed a bug in the data transfer. if you open the tournament details on a tournament you have already added as favorite, you'll see that the location title is missing. 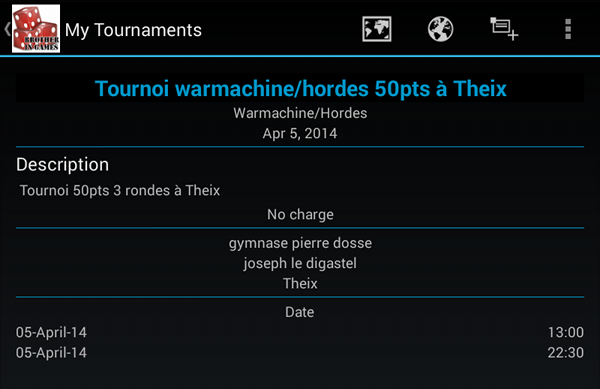 Tournament details on a Nexus 4 with the missing location title. This is due to a bug in the Brothers In Games T3 app. It have been fixed in the version published today, so please, update to version 1.8.1. Once you'll update the app, it is supposed to clean the cached tournaments to refresh the data and include that information. If you still encounter the problem, go to the app information and force the clean of the data. Unfortunately, this action will not add the tournament title in your favorite tournaments, so if the tournament is still in the futur, delete and import it again. Otherwise, an update feature is planed, you'll be able to change it yourself from that feature. New updates are planned shortly, keep an eye on your notifications.